a peak/trough 15 week low is due any time now. i have astro turns tomorrow, 23, bradley 28th , and astro turn the 29th. Thanks Charmin, I should have read this before my post, answers some of my questions. Looks like it could rally leaving a broken head and shoulders pattern. Right now, there's a descending right angled triangle. Nice move. 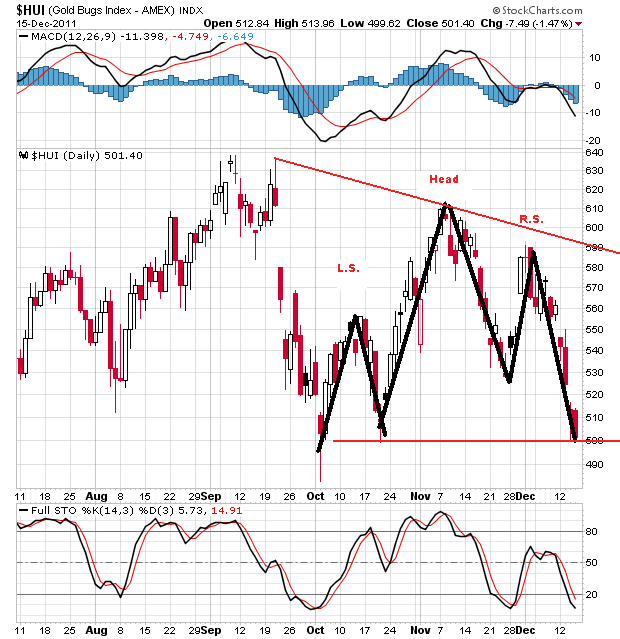 It is near a low for wave 4 (still in macro 3rd up). While it could change on a day's notice, there's a bullish volume pattern to NEM's Possible triple bottom pattern. 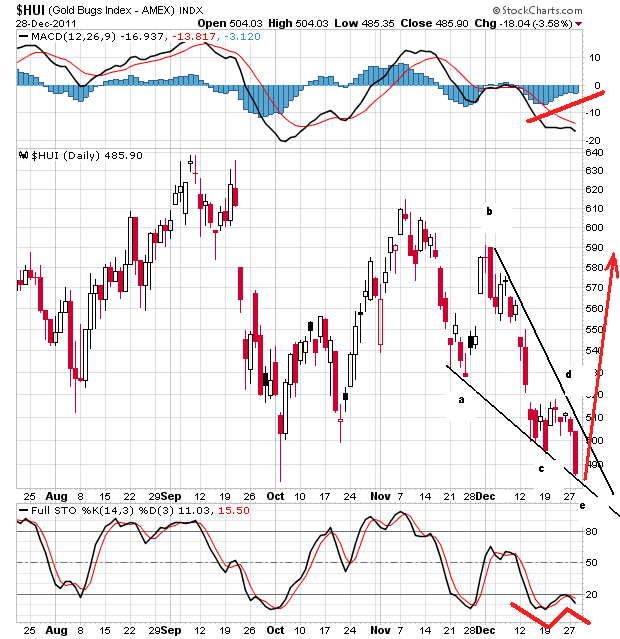 The pattern looks like a falling wedge. Stochastic is in the process of "double dipping" and MACD histogram is non-confirming. If I refer to one of my last posts, the situation was that there would be "a resolution within months." Another trader I often read says "I'm seeing some eerie similarities between the action in the US dollar index and gold to what I saw in the summer of 2008"
I have to believe that this third wave of selling in silver is the time to start thinking about watching for bearish burnout. Both the long term and short term appear reasonably bullish based on my stochastic studies. Here's the daily. 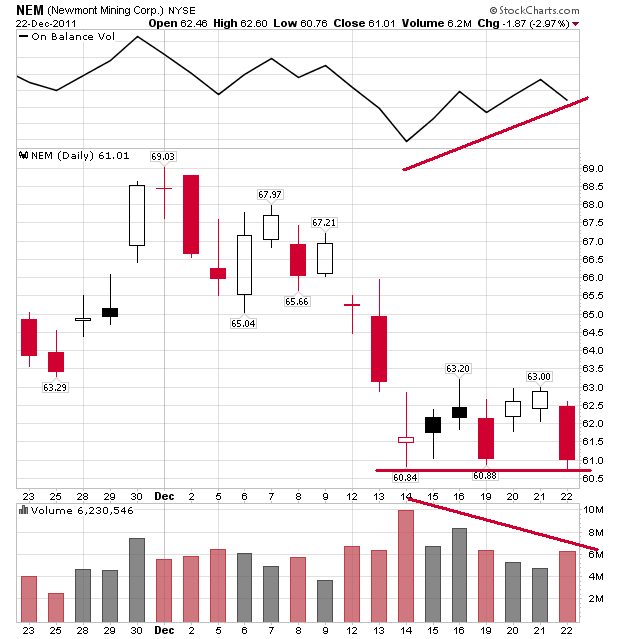 The candle is a hybrid---a cross between a doji and a hammer. In any event it has a long bottoming tail. Daily stochastic may be about to "double dip" or double bottom. 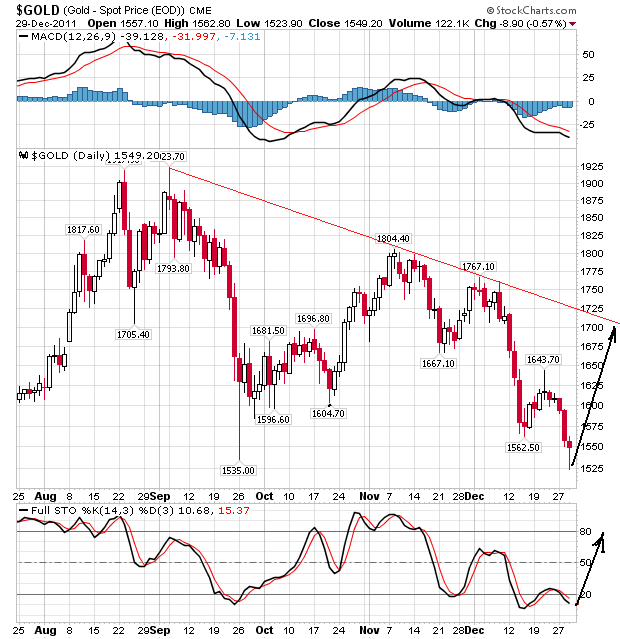 Momentum will turn bullish on a rally above 20. There's significant divergence in the MACD histogram, and it won't take much for a crossover to turn the trend. Too many bears out there, but watch the upper trendline. You might get a dead cat bounce here but if you are expecting a panic to the upside, I don't think so. Gold just dropped $400, it will take time to repair the damage. The good news is that the HUI held a $480 closing pricing (and silver is doing fairly well). Good time to bottom fish, maybe but gold stocks don't usually take off with a vengeance until August. And there is still a possibility of confirming a bottom in January. A triple or quad bottom check would be more like it. A breakdown, then it is back to the drawing board.